...the Up’s smartphone cradle, which is too small to accommodate the latest iPhone. 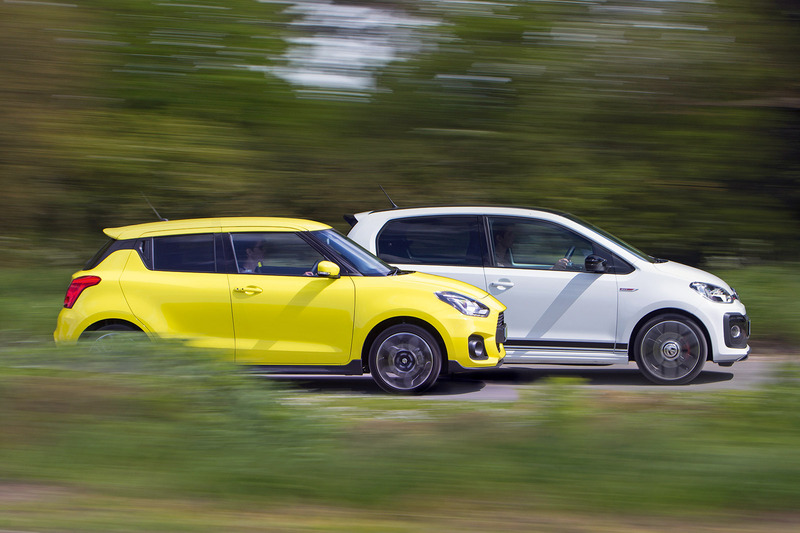 Raw power has never been the Suzuki Swift Sport’s thing. Traditionally, its raison d’être has been to wrap up just enough performance in a relatively svelte package and sell it at an attractively low price. The previous-generation Swift Sport produced just 123bhp from its naturally aspirated 1.6-litre engine. Measuring it against a 300bhp- plus, all-paw mega-hatch wasn’t so much like bringing a knife to a gun fight as attempting to face down a howitzer with an egg whisk. But on the right road, and when you got that free-revving four-pot whirring like David’s slingshot arm, it could give any of the hot hatch Goliaths pause for thought. It used its agility to overcome any performance deficit and emerged as one of our favourite driver’s cars on a pound-to-pound basis, providing a legion of nascent but impecunious enthusiasts with a realistic route into the hot hatch club. Volkswagen successfully miniaturises the performance Golf’s recipe for the first time - but does the hot supermini have a chassis to match its newly acquired engine? 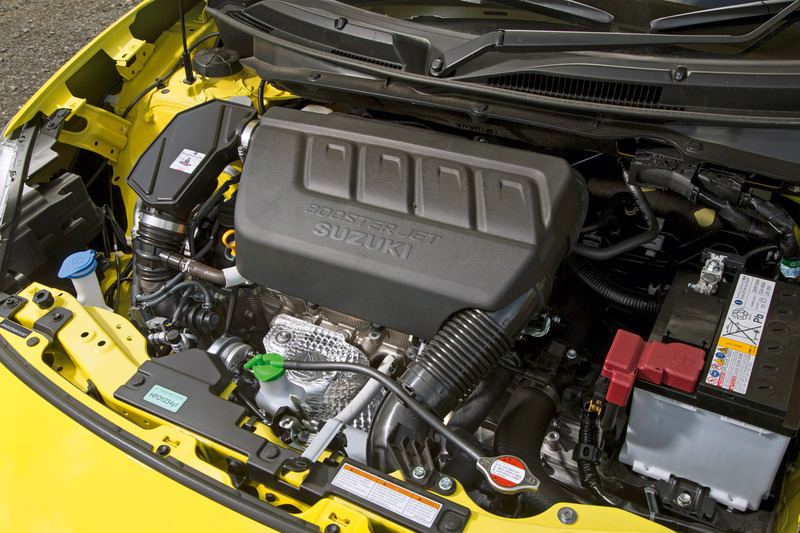 Times have moved on, and Suzuki is no more immune to the pressures of tightening emissions regulations than any other manufacturer. So it is that this new Swift Sport, the third, is fitted with a turbocharged 1.4-litre motor. It’s the same BoosterJet lump as you get in Suzuki’s larger Vitara and S-Cross models. That might sound like something of a passion-killer, but the unit has been tweaked to produce 138bhp and 170lb ft and it doesn’t exactly have a lot of car to pull along; even in its latest guise, the Suzuki bucks the general industry trend for significant model-on-model weight gain by continuing to weigh about as much as a bag of Maltesers. What’s expanded as dramatically as Mr Creosote’s waistline, however, is the price. Suzuki will charge you £17,999, pushing the Swift Sport to the fringes of Ford Fiesta ST territory, which is the car industry equivalent of smearing yourself in chum and leaping feet-first into shark-infested waters. A tacit acknowledgement of how ambitious this pricing strategy is can found in the fact that Suzuki UK is offering a £1500 discount on the price until the end of this month. Of course, the Japanese company will point to how you still get a lot of car for your money, which is true, but the price increase leaves the Swift Sport’s traditional bang-for-buck superiority exposed to some potentially compelling pretenders. Indeed, you don’t have to look too far for another modestly powered hatch vying for top honours in the sub-140bhp, affordable pocket rocket category – and this one’s pert rear bears three evocative letters that will rouse the attention of any self- respecting hot hatch fan: GTI. Wolfsburg’s announcement that it would sprinkle its magic go-faster dust on the Up, the smallest model in its range, was initially greeted with a mixed reaction. Glass-half-full merchants reckoned the UpGTI would distil the spirit of the Mk1 Golf GTI, melding a light kerb weight with a small, nimble footprint and plenty of power to heady effect. Others furrowed their brows as they surveyed the Up GTI’s spec sheet and smelled a cynical marketing ploy aimed at exploiting the rosy-tinged nostalgic glow that surrounds the first high-performance Golf. Either way, what the Up GTI did at launch was to slip deftly into a space in the market that the previous Swift Sport inhabited. So is Volkswagen’s baby the new bang-for-yer-buck champion? 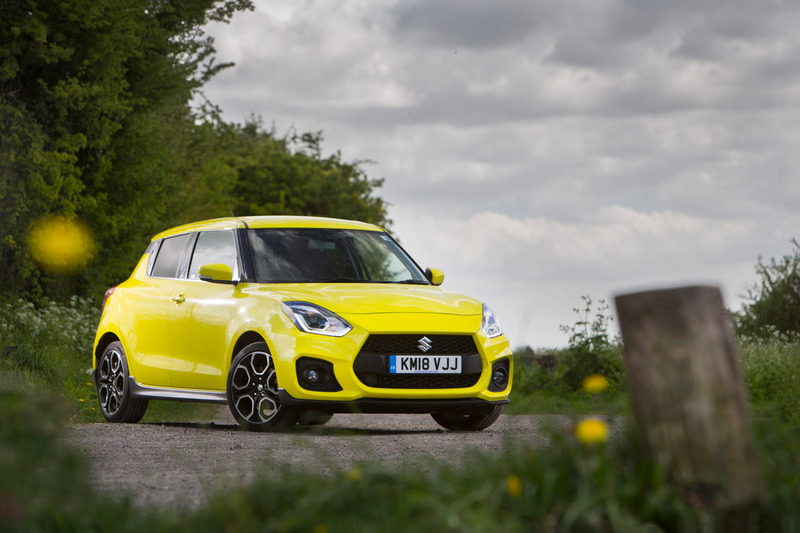 Or is the latest Swift Sport so good that you’d be well advised to speed-read the remainder of this article and get on the phone to your local Suzuki dealer pronto before that £1500 discount offer expires? Glance at the Up’s vital stats and you may think that it’s at a distinct disadvantage. The Up GTI makes do with a 999cc 113bhp three-cylinder unit. Where the Swift Sport’s engine makes 170lb ft, the Up has only 147lb ft. And where the Swift Sport tips the scales at 975kg, the Up weighs in at a comparatively portly 1070kg. 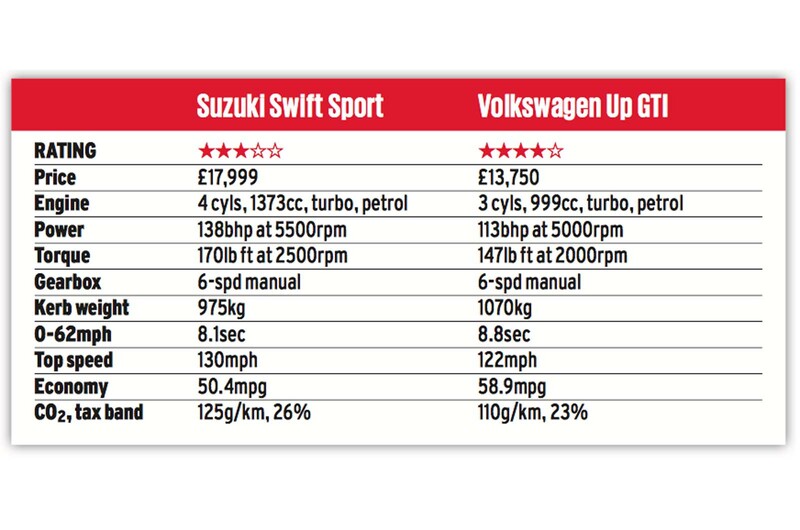 In a game of Top Trumps, then, the Suzuki has the VW licked. But as is so often the case when it comes to cars of th nature, on-paper merits count for only so much. Of greater importance is the manner in which they go about fulfilling the brief. 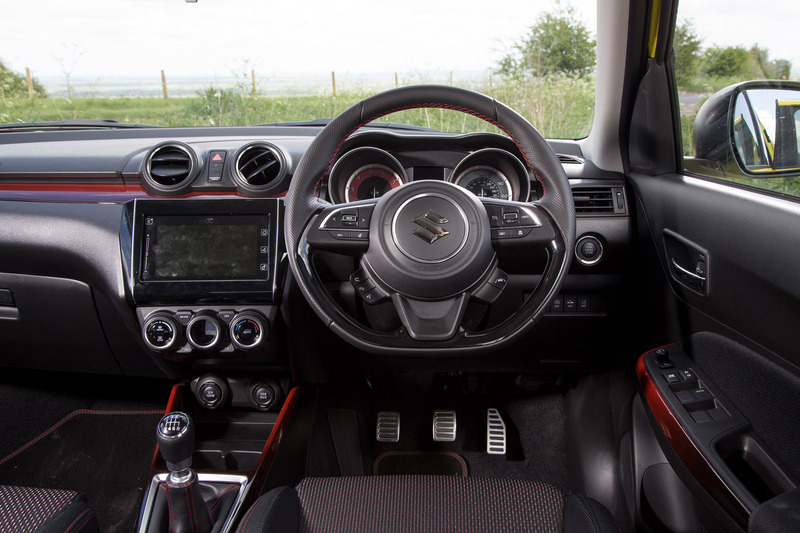 Sliding down into the Suzuki’s sport seats, the driving position carries all the suggestions of a car that’s been set up with a more spirited style of motoring in mind. The seats provide just the right amount of bolstering, and the pedals are spaced in a manner that’s conducive to heel-and-toe gearshifts. By contrast, the Up doesn’t impress quite as much, feeling much more like the everyday city car variants upon which it’s obviously based. The sports seats – resplendent in their ‘Jacara’ cloth upholstery – are relatively flat and wide, and aren’t anywhere near as cosseting as those in the Swift. They’re by no means uncomfortable, but they don’t give off the impression that they’ll keep your torso stable when the time to throw the Up into a faster corner inevitably comes. The pedals are decently spaced but also positioned quite high, which means that there’s a fair deal of ankle articulation required to rev-match in a tidy fashion. Swift pips Up once again, then, but things immediately start looking up for the, erm, Up as soon as you fire up the three-cylinder engine. It’s not the sort of engine that’ll make the hairs on your neck stand on end with its sonorous soundtrack, but it’s characterful and rorty in the way many three-pots are, and the hearty thrum audible in the cabin lends the Up a personality not dissimilar from that of a feisty scrum half: it’s small, but there’s no way it’ll back down from a scrap with bigger lads. Despite its tiny displacement, it’s a muscular engine. Its 147lb ft arrives at a lowly 2000rpm courtesy of its turbocharger, so there’s plenty of low-down shove. From a standstill, it’ll get to 62mph in 8.8sec and hita claimed top speed of 122mph, so it’s certainly not the fastest car in the world, but it’s the manner in which the Up’s diminutive footprint helps provides the illusion of speed that is one of its most enjoyable traits. Regardless of how fast you’re travelling, the Up never feels anything less than entertaining. By contrast, the Suzuki has a far more sober demeanour, arguably the product of a powerplant that seemingly has more in common with a blender than an effervescent, hot-hatch four-pot. Still, despite itsuninspiring soundtrack, the Swift is faster than the Up by a noticeable margin, and because its peak torque is available higher up the rev band, at 2500rpm, it also encourages a greater level of interaction with its precise, if a little forgettable, six- speed manual gearbox. Through the bends, both cars feel as though they suffer slightly from their taller statures and relatively slab-sided shapes. Their inherent top-heaviness leads to a noticeable amount of lateral roll through faster corners, causing them to hunker down on their outside wheels. That said, neither feels particularly wayward or short on grip, and the adjustability and responsiveness of their respective chassis makes both of them plenty entertaining at speeds that won’t get you into trouble with local law enforcement. Despite the playful nature of the way each car goes about tackling a challenging section of road, though, neither has particularly memorable steering. The Swift’s rack feels artificially heavy yet lacks feel, and although the Up’s is weighted more naturally, it’s equally as tight-lipped about what the front wheels are doing as the Swift’s. It’s also worth touching on practicality. The Swift is the larger of the two, so it understandably offers more space in the rear, as well as a larger boot. Don’t write off the Up as grossly claustrophobic, though. Two adults will fit in the back reasonably comfortably – over short distances, anyway – and its 251-litre boot is only 14 litres less capacious than the Swift’s. But which of the two is the one to go for? Well, a brief summary goes like this: the Swift is the quicker but it lacks the Volkswagen’s up-and-at- ’em zestiness. 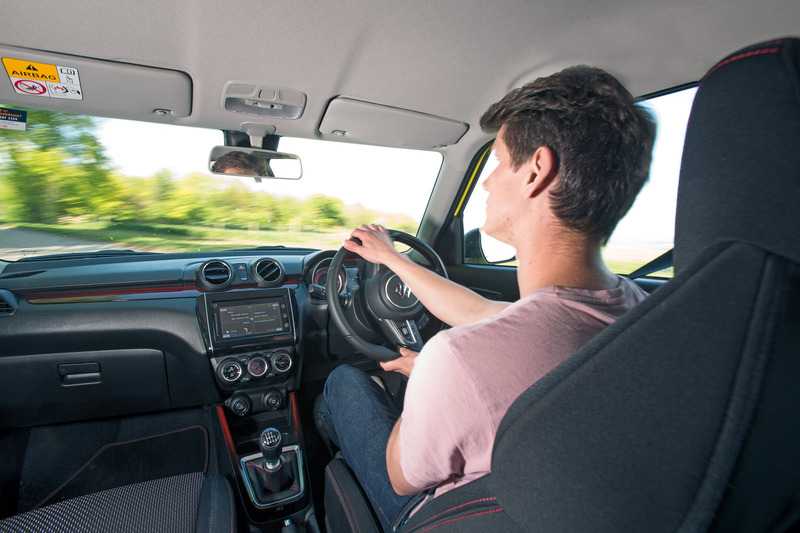 The Swift’s driving position is a touch more in tune with a hot hatch’s than the Up’s, but the VW counters with a much more appealing soundtrack from its three- cylinder engine. And while both have an enthusiastic and engaging demeanour through the corners, they’re both slightly compromised by steering racks that leave you wanting for a bit more in the way of feel. A close call, then. Except we need to come back to the thing that made the original and second-gen Swift Sport the featherweight champions that they were: price. And boy, do things start unravelling fast forthe Suzuki when you factor the asking price into the affordable hot hatch equation. VW, by contrast, is asking for £13,750 for the Up GTI. And although you do get a proper infotainment system (the Up has a basic 5.0in screen and a smartphone connection) and adaptive cruise control with the Swift, a £4249 premium for a car that’s not quite as characterful or entertaining is ultimately a tough pill to swallow. A strange role reversal has taken place with the Suzuki, then. David has become something of a Goliath. And because of this, the smaller, cheaper and more fun Up GTI sling shots past it into first place. Renault Clio RS 182 Trophy: The ultimate iteration of the Renault Sport Clio. It feels a little dated inside, but offers a tactility and sweetness that few more modern hot hatches can match. Buy now, and watch it appreciate. 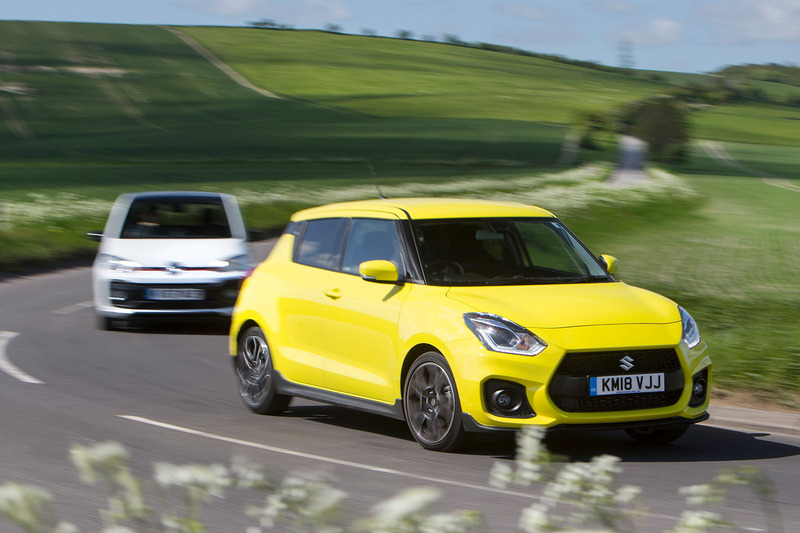 Suzuki Swift Sport: The archetypal less-is-more hot hatch, the previous-gen Swift Sport now costs buttons to buy and run, yet will provide smiles by the bucketload in all environments. Equipment levels are high, too, and they don’t tend to go wrong. Mini Cooper S: The second-gen Cooper S is available surprisingly cheaply with a few years under its belt. It’s one of the best hot hatches of its age, with a stiff, delightfully throttle- adjustable chassis and a punchy engine. Abarth 500: The first hot 500 is rough and ready to drive, but immensely characterful – and quick, too. The smart interior contrasts with the dour grey plastics you to find in most modern cars. Few hot hatches have such an overt sense of fun. Vauxhall Corsa VXR: The Corsa VXR still has a whiff of boy racer special about it, and it isn’t the most polished hot hatch you’ll find for this sort of cash. It is, however, fast and lairy, both to look at and to drive – and it’s also getting very cheap to buy. My son has a Citigo, same car as standard Up really, it is Tardis like inside, I'm 6'3 and have no problem sitting in the front or back, I'd take the UP as it has more character and is actually very practical, Suzuki have taken themselves out of the fight by asking several thousand pounds too much for the Swift, Fiesta ST anyday. The Up/ Citigo/ Mii is reminiscent of the Austin 7 - pretty much all you need in the real world. The Swift is the Japanese take on the same minimalist vehicle with slightly less minimalism - including price. I'd go for a cheaper Skoda version of the Up as a vRS! I wonder which of these 2 the journalists would prefer if the cars were the same price? In reality these 2 would work out the same price, post negotiated discount, and paid for on a personal contract plan. I know this because I ordered the Gti back in February. With most of the options boxes ticked, and a £1800 pound discount, the Up! Is going to cost me £150 per month with a £4000 deposit over 48 months. I still have no build date for the Up! So I enquired with an online broker and they found me a swift sport in my choice of colour for immediate delivery, and after a £4K deposit it’s going to cost pretty much the same each month over 48 months and 10000 miles pa.
Having now driven both cars, I’m going to wait it out leave my deposit with the VW dealer. I just found it more fun and characterful. The size, and performance difference is negliable. And I can firm that an iPhone 7+ does fit into the Up!’s cradle. 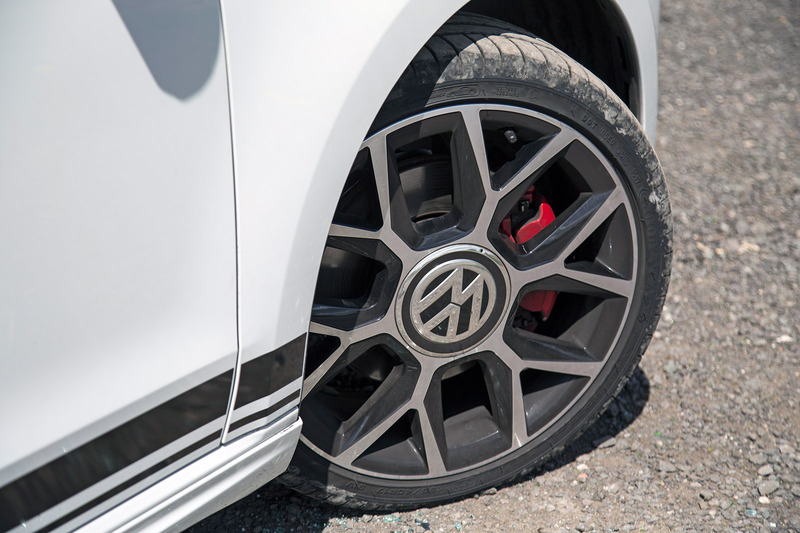 Would be nice if you could get the GTI gearbox and suspension in the regular UP, don't fancy the low profile tyres on UK roads but I prefer the stiffer suspension, also the GTi look is a bit looking like you are trying too hard to have fun. The review says the Up has sports seats ... aren't they just the standard seats with a check fabric? This is one of my main gripes with the Up. 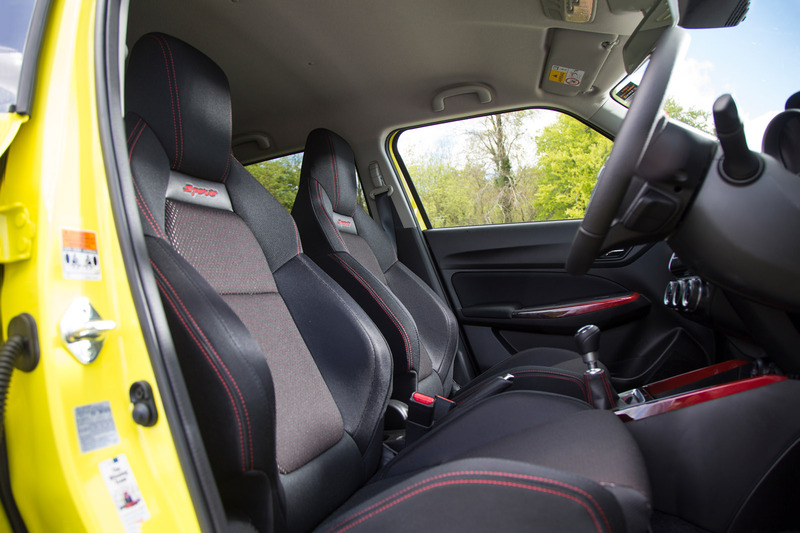 A Gti should have proper sports seats, not just for the extra comfort and location, but they change the whole ambience of the interior of a car like this. grand cheaper, but once you try and match the spec, there isnt actually that much difference in price, and the Up still has a cheap and nasty interior, quality it isnt. At least the swift look the part inside. It may not matter to the reviewer, but if your kids are aged 4 - 9 years old in most cars they can just let themselves in. Not in a Swift with those stupid high handles! So ordered an Up GTi for now - otherwise in the Suzuki you'll be forever walking around the car sorting out the kids doors!!! Stupid design.